I've written ad nauseum about my love for the music of Public Enemy. When I put on It Takes a Nation of Millions to Hold Us Back or Fear of a Black Planet, I'm with Chuck and Flav word for word. One of the more controversial and popular tracks from the aforementioned Fear of a Black Planet album was "911 is a Joke". "911 is a Joke" was a politically charged attack on the emergency phone number and had absolutely nothing to do with the events of September 11, 2001, a day that was more than eleven years into the future when Fear first dropped. That wasn't so obvious to the Washington Post. In an article from November 26, they made the following statement. Public Enemy has earned notoriety with more than 20 years of politically charged music about fighting the power, challenging racism and declaring that 9/11 was a joke. The group has joined forces with Virgin Mobile USA to combat youth homelessness as part of National Hunger and Homeless Awareness Week. 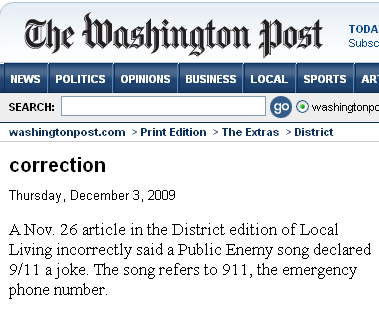 The Washington Post has since put out the best correction I have ever seen. And in case that correction disappears, here it is for all eternity. And because I love the band, and this is as good an excuse as any, here's "911 is a Joke". I wonder what Chuck D thinks of the reality TV shenanigans of Flavor Flav. No worse that Dr Dre shilling for Dr Pepper.